The historic city of Edinburgh is brimming with old castles and fascinating sights that can be enjoyed by adults and children alike. Kids love Edinburgh's spooky aspects; the castle alone could fill a whole day with excitement. An outing to the Royal Yacht Brittania or a visit to the many animals at the Edinburgh Zoo can be appreciated by the whole family. A picnic and Frisbee session in the beautiful Royal Botanic Garden for some fresh air and sunshine is another lovely way to spend a day. For an educational excursion, visit the Museum of Edinburgh to soak up the history of this famous city, or venture to Our Dynamic Earth which will astound the little ones and get them thinking about their place in the grand scheme of things. When skies are grey and outdoor attractions are not an option, take the kids to discover some aquatic animals at the Deep Sea World Aquarium, or make use of indoor playgrounds such as the one in Edinburgh Park, Happy Castle Play Centre or Time Twisters. 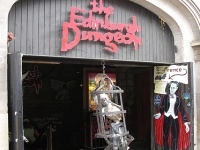 Another real highlight for kids (and often their parents too) is the Edinburgh Dungeon.